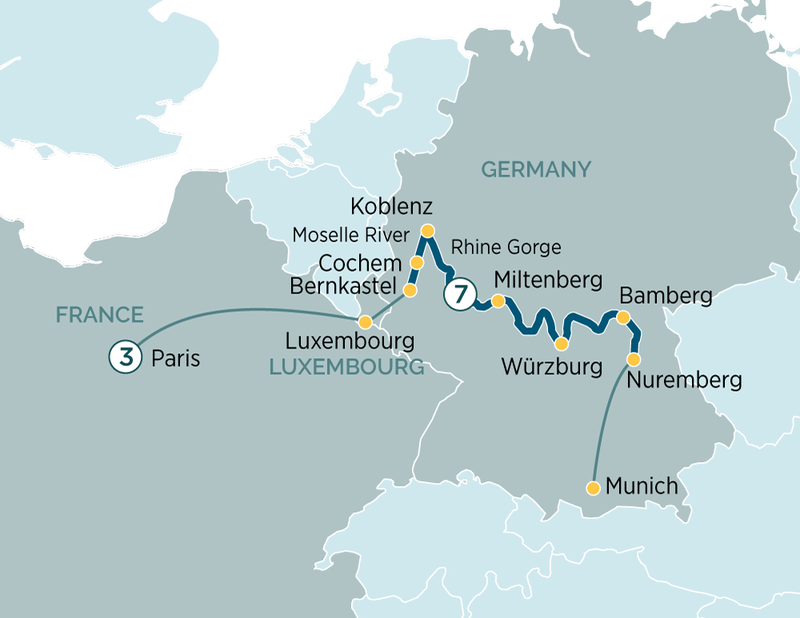 Check three countries off your list in a single day when you travel from Paris to Bernkastel. Your journey by coach will take you to Bernkastel where you will join your Emerald Waterways luxury river cruise ship. Today you arrive at the enchanting town of Cochem. In the morning you will have a guided walk and the opportunity to visit the Reichburg Castle. Welcome to Miltenberg, a picturesque village on the Main River, which creates an imitable feeling of Bavarian life in medieval times due to the Old Town being lined with well-preserved half-timbered buildings. The gothic Merchant Hall is an impressive symbol of past affluence created by trade from river traffic. After your included tour of Miltenberg and free time, you will be transferred by coach to the stunning medieval glass-blowing town of Wertheim. Known as the “Pearl of the Romantic Road”, Würzburg is surrounded by sloping hills covered with vineyards. Visit the Bishops’ Residenz, one of Germany’s largest and most ornate baroque palaces and a UNESCO World Heritage Site. Your tour highlights the palace’s unique staircase, elaborate 18th century frescoes and the amazing 3–dimensional stuccowork. This evening, the Captain will be delighted to welcome you to the Captain’s Farewell Dinner. After breakfast it is time to farewell your fellow passengers and disembark the ship for your transfer from Nuremberg to Munich Airport for your onward or homebound flight.